The White Mountain ice cream maker produces homemade ice cream quickly. No more sore muscles and hours of endless crank turning are necessary to enjoy the deliciousness of homemade ice cream. Gather the family around; the anticipation and fun are still there! The New England white pine bucket lends an antique quality to the ice cream maker that everyone will appreciate. The corrosion resistant, triple action dasher never gets tired of mixing ice cream thanks to the three gear electric motor system. A stainless steel inner bucket holds the ice cream mixture and chills effectively. In 20 to 40 minutes, you'll be enjoying homemade ice cream. Make enough for everyone since this machine makes up to six quarts. A five year limited warranty gives you peace of mind. Try the included recipes to get you started. 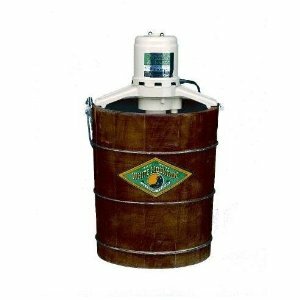 The White Mountain ice cream maker has a 12,000 RPM commercial-grade motor to churn your creamy mixture. It easily stops so you can add fresh fruit or other ingredients and starts right up again with no problem. The machine easily churns out gallons of ice cream and lasts for years. If you like to make a lot of homemade ice cream, you can get extra mixing tubs separately. The ice cream turns out smooth and silky and keeps well in the freezer without turning into one hard lump. Original White Mountain machines were still making excellent ice cream after 30 years. Some customers are getting excellent results with the new Rival versions of this traditional ice cream maker as well. The White Mountain ice cream maker seems to have developed some issues since the company has been purchased by Rival. Several customers had defective motors that would either burn up or break gears inside when churning. Rival's customer service leaves a lot to be desired, telling customers it would take 4 to 6 weeks merely to send out a return sticker for them. Rival has admitted there is a problem with some of the motors. The wooden bucket no longer holds up; it dries out quickly and lets the brine run out. No amount of soaking corrects the problem like it did on the old models. Some customers had to use a hammer to lock and unlock the tub. For those customers who have been pleased with this ice cream maker, the only downsides were the cost and the noise the motor makes when churning. Some customers have reported that Rival has changed the warranty to one year instead of five. The White Mountain ice cream maker has a great reputation. Since the company has been bought by Rival, there seem to be a few problems. Most customers still get a great product, but about 8% of customers who talked about their experiences had bad machines. This ice cream maker could easily go on for many years on its past reputation, but if Rival doesn't step up and make the product as good as it once was, sales will plummet fast. At such an expensive price, customers deserve an ice cream maker that works every time. If you are considering this model, chances are you'll get one that serves you well. If you are one of the unlucky ones, you'll never want to deal with this company again. Weigh your options and make the choice that is right for you. At the time of writing this review, Amazon had the White mountain discounted 30% and it ships free with super saver.